Chinese Regime Implicated in Staging Violence in Lhasa. By Qin Yue and Qi Yue. March 29, 2008. Evidence is accumulating that the Chinese regime orchestrated violence in Lhasa in order to discredit the peaceful protests of Buddhist monks. According to the Dalai Lama's Chinese translator, Ngawang Nyendra, a witness reported that a Chinese policeman in Lhasa disguised himself as a Tibetan and joined the protesters holding a knife in his hand. This witness also recognized the man from BBC news footage and news photos provided by China. A Chinese woman from Thailand (who prefers that her name not be used) was studying in Lhasa when the protests broke out in March. As one of her friends is a policeman, she visited him at the local police station quite often and got to know other policemen there. After the protests on March 14, she and other foreigners were sent to the police station where she saw a man with a knife in his hand walking in with some arrested Tibetans. 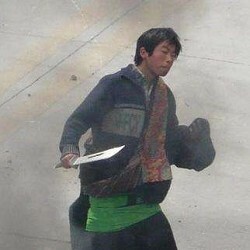 The man later took off the Tibetan-style clothes and put on a police uniform. This woman was sent out of Lhasa with other foreigners the next day. When she arrived in India via Nepal, she recognized the policeman she had seen in Tibetan garb from BBC TV news and photos that the Chinese embassy had provided to the media. Ngawang Nyendra said the witness was shocked when she saw the policeman in the BBC broadcast. She realized then that the man had disguised himself as a Tibetan in order to incite people to riot. The witness contacted a Tibetan organization in India and told them what she had seen. 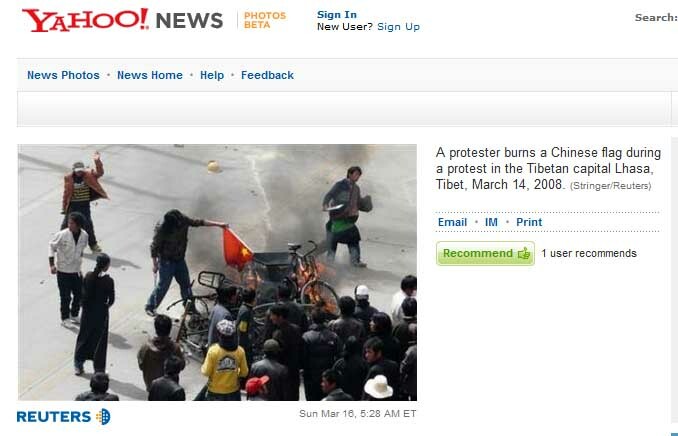 At a rally on March 17, the organization publicized a news photo originally provided by the Chinese Embassy in India in which the policeman appeared as a Tibetan rioter. On Xinhua and other Chinese-language Web sites friendly to the regime, after the rally at which the witness spoke, the policeman in disguise had disappeared from photos taken at the same scene in which he had previously been visible. Recently, the original man-with-the-knife photo has returned to these Web sites. Ngawang Nyendra said, "This photo with this man in it was sent by the Chinese embassy to BBC and Radio Free Asia. The other photo was sent out later. They are exactly the same except the man has disappeared from the second photo. From the TV news footage, you can see this man attempting to stab other people with a knife. But in later shots you can't find this person any more. They were acting. After people raised questions about these shots, this footage never appeared on TV again." with a knife taking part in a riot. at a rally in Darmasala. [The Dalai Lama's Chinese translator] Ngawang Nyendra said, "This photo with this man in it was sent by the Chinese embassy to BBC and Radio Free Asia. The other photo was sent out later. They are exactly the same except the man has disappeared from the second photo. From the TV news footage, you can see this man attempting to stab other people with a knife. But in later shots you can't find this person any more. They were acting. After people raised questions about these shots, this footage never appeared on TV again." But did BBC and Radio Free Asia need the Chinese embassy in India to provide them with this photo (or the other one)? No, they already had it as did virtually all the media around the world. My initial encounter with this photo was in Apple Daily (March 16, 2008) and this is the online version in its original scale. It has a high resolution where all the details are visible. Apple Daily sourced this photo to the Reuters agency. When I went to the Yahoo! News Photos (transient link), I found this photo with the relevant description and credit. The photo had been taken by a 'stringer' (i.e. freelancer) who reached agreement with Reuters for distribution. You will note that the two photos are cropped somewhat differently in order to fit the page layout, but this is editorial judgment which does not change anything. 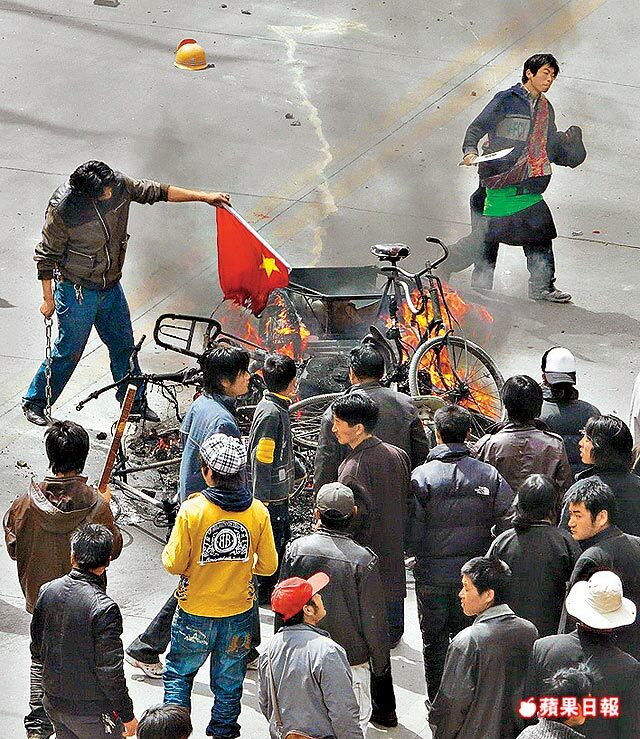 ... a lot of the photos from the 'Lhasa Burning' post show people's faces and may lead to their arrest. As such, I will be taking these particular photos down - if you think other photos should be taken down for similar reasons please make a comment so that I know about it. I will admit that I struggled with this decision for a little while: many of those shown in the photos were acting little better than violent thugs when the pictures were taken (e.g. in the flag burning photo one of those shown began throwing rocks at others in the hotel moments after I took the picture) so I'm unsure if they actually deserve any protection from the authorities. That said, I will keep those particular photos off my blog for now. By March 16, this Reuters photo was known around the world. BBC and Radio Free Asia would have to be comatose not to be aware of it. If the Chinese Embassy (where?) had forwarded the photo to BBC and Radio Free Asia, it would not be as a new discovery but as a sarcastic reminder: "Every other media outlet in the world is aware of this but you are obviously determined to ignore it!" It was also impossible for the Chinese Embassy to scrub the man with the knife from the photo because it was neither the source nor the distributor -- the world has already seen it! Was Kadfly actually a Chinese agent assigned for this job? You can read his own response on this type of charge (see link). But he was not the sole observer as there were actually several others who also took photos and videos (including the famous 41-second video clip of the Chinese motorcyclist being assaulted by Tibetan rioters). From the TV news footage, you can see this man attempting to stab other people with a knife. But in later shots you can't find this person any more. They were acting. After people raised questions about these shots, this footage never appeared on TV again. If there was TV news footage, it would have been posted on YouTube or some other video-sharing site. It would have been impossible to retroactively scrub the record either. The Dalai Lama's Chinese translator seems to be stuck in the pre-YouTube age. How is that possible? Xinhua and other Chinese-language web sites do not have total control over the exhibition/distribution of the said photo worldwide. At most, they account for only a miniscule faction of the circulation. The photo as posted here is a public record that cannot possibly be altered by Xinhua. So what is the purpose of such an action except to bring attention to the attempt? There are probably two types of people out there. The first type of people are those who believe that the FLG media are irredeemably mendacious and there is no point in wasting another precious moment of their lives thinking about them anymore. The second type of people are those who are wary of the FLG media but regard them as allies in the fight for freedom and democracy in China. Until the moment of liberation arrives, one does not criticize one's allies. I belong to the first type of people who no longer want to waste a moment in life scrutinizing FLG news reports. The target of this essay is really about the second type of people who apparently know about this but choose to either ignore or rationalize it for strategic reasons. The problem with this approach is that nobody respects or trusts you anymore. (Blogdai) Blogdai Interviews Kadfly. April 15, 2008. I forwarded your questions to my kadfly e-mail to verify my identity since I post about this e-mail address in this post (along with why I no longer have access to the photos on my SD card). It is also for my own purposes as I would like all blog-related correspondence to now go to this address. (Kadfly@gmail.com) If you need me to make a post or something on the blog to further verify my identity just let me know. 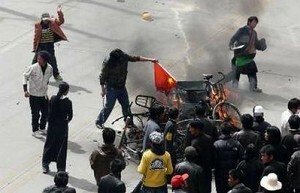 (blogdai questions in bold) Much has been made of the Riots in Lhasa. Both the Tibetan and Chinese versions differ significantly. What, from your first-hand observations, started the whole thing and what seemed to be the greatest instigating factor? It seems the protests by the monks in the days leading up to the 14th led to a response by the Chinese and this response in turn led directly to the riots. The whole thing on the 14th really seemed to kick off with the blockading of the Ramoche Monastery: this seemed to infuriate ordinary Tibetans and the riot began minutes after the Chinese police were dropped off on Beijing Donglu to close the alley leading to the Temple. Which media side seems to be the worst at fairly representing events as you witnessed them? I haven't been that exposed to what the Chinese media is reporting, to be honest. But the photo cropping allegations (CNN and the trucks being stoned) and the use of pictures of police brutality from Nepal to illustrate stories about what was happening in Tibet does make me believe the Western media has not tried particularly hard to fairly represent the event. But as I said, I'm not aware of what the Chinese is doing so I cannot really compare the two. That said, I do hold the Western media to a higher standard than their Chinese counterparts, for obvious reasons :P.
Your photos have been picked up (uncredited) by the BBC, CNN and the front page of the New York Times. Some media renderings show only partial aspects of your photos which may imply a meaning that differed from the original photo. What is your opinion/experience with the Western media's use of your material and coverage of the events in Lhasa? My main concern is how the Western media decided to completely ignore the violence of the protesters and concentrate on the resulting crackdown, which I actually had not witnessed. They used the police shields photo as a sign of Chinese strength, for example, without pointing out that seconds after the photo was taken the Chinese police actually fled for their lives. As you may have observed, the Olympic torch relay has become a public relations disaster for the Beijing and International Olymice committees. Your coverage of events in Lhasa differed from the official Chinese version of events and may have been a significant catalyst in the torch demonstrations we see worldwide today. Did you ever have a sense of the importance your live coverage of the riots would carry in terms of world events today? No, and I still don't think it has been very important, to be honest. I think all of this would have happened with or without our photos. Tibetans know this year is their chance to really force the issue. There are many theories that ethnic Hans were just trying to work and make a living in Lhasa and that the real obstinance resided in the PCC and Chinese administration in Tibet. Do you think such a two-tiered Chinese presence exists in Lhasa? I really don't think I am familiar enough with Lhasa or Tibet more generally to comment on this. But I think it is plausible: I met an ethnic Han person from Singapore who ran a coffee shop in Lhasa, for example, who I sincerely doubt is trying in any way to crush Tibetan independence. Similarly, I met an ethnic Han person from Hong Kong who was looking to start his own company in Lhasa who would regularly laugh at the official Chinese coverage of the riots. Internet access was heavily scrutinized during the riots and the Chinese government has threatened to block all connections during the olympics. Did you feel watched or scrutinized during the times you posted to your blog from Lhasa? At the Yak Hotel we first uploaded photos via the public internet room. A man (I think one of the managers of the hotel) came into this room mid-afternoon, yelled at the girls who worked there for letting us use the computers, and went to each computer and turned them off without saying a single word to any of us. But for some reason (they probably just forgot) they left private internet connections within rooms open so once we had a laptop we were again free to upload photos. As time went on I often felt like people might be listening to my cell phone or reading my blog postings and e-mails but I think this was paranoia more than anything. The internet police were definitely not trying very hard to shut down either internet connections or the cell phone network. Tibet is scheduled to reopen May 1 to tourists. What will they find in Lhasa? Some ruins, troops/police still in the streets but life as usual other than that is my guess. This has basically been the situation since March 18th, from what I hear. Your blog received hundreds of postings during your stay in Lhasa. Many posters were angry pro-government supporters. Have you received any further or secondary contact from Chinese officials or supporters since your departure from Tibet? No. All contact with those who read my blog who I do not know personally has been limited to the comments section with the exception of you and a few journalists. Did you receive any other significant contacts, invitations or acknowledgements from your coverage? Only from you :P. I will be receiving some portion of $2800 US from Reuters (a portion is going to our journalist contact who brought my blog to the attention of the major news agencies and negotiated on our behalf) which I will be donating and I have been interviewed by some media outlets. How was the border crossing into Nepal? We understand security was stepped up significantly, is this true? No, actually. Security may have been beefed up before the 20th or after (the day we arrived in Zhangmu) but crossing that particular day was extremely easy (and there were no extra officers than was necessary). Everyone in our group was hiding their memory cards and the such but it was completely unnecessary. The Chinese customs people appeared bored if anything and didn't even ask if we had come from Lhasa. It couldn't have been any more ordinary except for the journalists on the Nepalese side. The world seemed quite taken by your coverage. Perhaps it was because you came off as a concerned traveler who was just caught up in the moment. Do you have any plans to re-visit Tibet? What, if anything, can you tell us about your immediate future plans? Yes, I would love to revisit Tibet. I don't have any plans at the moment but I know I will return. I will be finishing my trip in India and flying home at the end of the month. Good, bad, indifferent or otherwise, is there anything you would like to add? Not at the moment, but feel free to ask more if you need to. 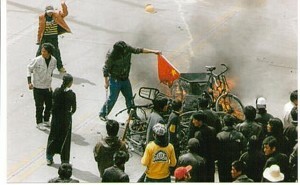 Relevant Link: A few more pictures from Lhasa Kadfly, April 4, 2008.